From the imposition of the city grid in 1811 through the present, the area known today as First Park has evolved from cemetery to neighborhood. From the early nineteenth century until the 1930s, Houston Street existed as a typical New York City street—narrow, edged on both sides by tenement buildings, characterized by the local cultural context of house, shop, neighborhood, and city, with clearly articulated identities of local and outsider. 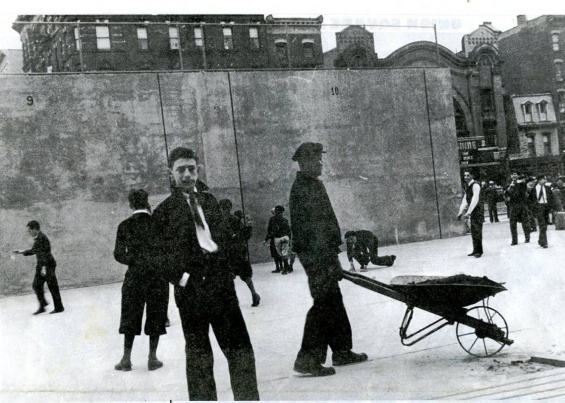 During the IND Subway extension project of the 1930s, the block between First and Second Avenues was cut in half; buildings on the north side of the street were demolished to widen the street. This dramatic, Haussmannian intervention on the Lower East Side brought the reality of the older section of town into closer proximity with the new city. When the building at 33 East 1st Street was razed and the remaining lot appropriated as parkland, a direct link was formed between these two conditions, what architects Silva Ajemian and Jorge Prado have described as the micro- and macro-locals. FSG exists to explore this fissure that has become a bridge, and a dynamic dialogue of the city with itself. Supported by New York City Parks and Recreation. Tours will be meeting at StreetFest at 2:30 p.m. and ending at First Park at 3:00.